Just a quick post to let you all know that I haven’t been completely idle. 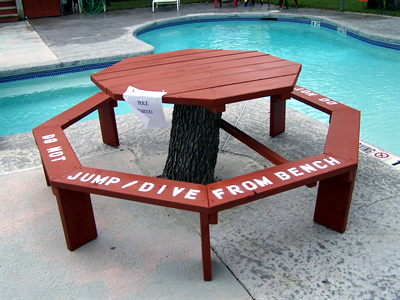 This 10 foot long bench and the octagon pool bench with table are two of the six that I have made for the park here with a skill saw and screw gun from stock lumber. 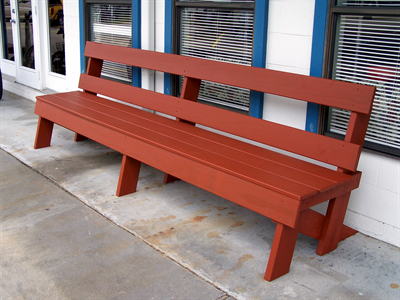 Nothing fancy but comfortable, durable places for people to sit and enjoy this areas wonderful winter weather. These are 2 spoons I carved to amuse myself when I did not wish to do anything complicated or particularly difficult. 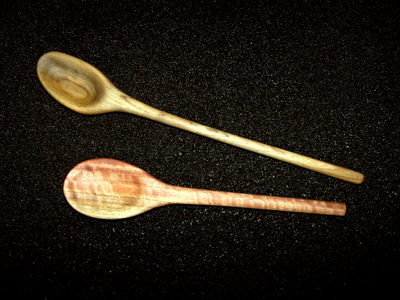 The top spoon is made from a piece of madrone that was a gift from my good friend Gerry in Medford, Oregon. The bottom spoon is of eucalyptus that I collected in Arizona. It is from a tree that was killed in the freeze of 2011. I finally finished this little guy. 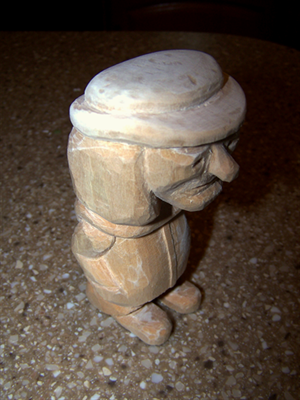 I started carving him at Cape Disappointment where one of my fellow campers who saw me carving said he was a cute little man and the name has stuck. He is a freehand caricature, my very first. Here we are! I don’t know where we are. The signs, the GPS, and the map tell me that I am in Fulton. The closest post office is the Fulton post office. But, if you don’t put Rockport (the town about 10 blocks SW of us) on the envelope we won’t get the mail. Where am I? The Blue Lagoon RV Resort is our home base for the December, January, and February. It is pleasant, small (110 sites) campground right on the Texas Intracoastal Waterway portion of the Gulf of Mexico. We have had mostly very nice weather in the mid 70’s. Murphy lives here too and he enforces the same rules as everywhere else! The only bad weather occurs on the days when we are outside. Christmas here was nice even though we miss family and friends. We have made many new friends and did have a good time at the Christmas “Potluck” with the other “Winter Texans”. We also shared the day with the kids and grands via telephone. The very pretty historic part and the bustling newer section of Victoria made for nice diversion on one particularly rainy day. We did get a number of nice breaks in the weather but also had to make some mad dashes to stay somewhat dry. Elaine suggested and Gordon, with twisted arm ;-), went along with the idea of an ice cream lunch. On the way home we saw the outskirts of Port Lavaca a future day trip destination. Even though we did not see much wildlife the Aransas National Wildlife refuge was very nice. The weather wasn’t conducive to birding, it was cool enough that the reptiles were still in bed, and the mammals were hiding because we went in mid day. We did see some very good exhibits and met some of their friendly volunteers who encouraged us to apply to work with them. I had to go see this tree! It is known by various names: Goose Island Live Oak (It is on Goose Island), Lamar Oak (The port of Lamar was bombed and burned during the civil war), Bishop’s Oak (St Joseph’s Chapel is nearby), and simply Big Tree. It is a 1000+ year old example of Virginia Live Oak (quercus virginiana) with a trunk circumference of over 35 feet, a crown span of 90 feet, and a height of 44 feet. Growing old beats all viable alternatives, especially on the days when you refuse to act your age.